Don't be fooled, this fruit is tough. We owe you guys an apology. We've done you a major injustice. We've given you recipes for butternut squash that involve cheese and pasta. We've dangled acorn squash recipes that are drowning in butter in front of your face. We've even shown you how to bake a pie inside of a winter squash. But, we failed to tell you how to crack those thick-skinned winter squashes open. But DON'T. Take a deep breath and put down the mallet -- we're here to help. First, you should know that not all winter squashes are created equal. Some you should peel with a vegetable peeler, others demand a knife, and then there are some that don't need to be peeled at all. We've outlined it for you below. Put down the knife. To Peel Or Not To Peel? Yes. With a vegetable peeler is best. A nice sharp knife will work too, but a peeler is so much easier. But only after you give it a couple of minutes in the microwave to soften the gourd's peel. After that, peeling will be a breeze, and so will slicing or cubing -- as your recipe calls for. You should know that they call it delicata for a reason. This squash is delicate -- the weakest of all the winter squash.To Peel Or Not To Peel?Why bother? Just slice it in half, scoop out the seeds, and stuff this lil' guy. Or, slice it into quarter inch strips and bake. There is no risk of the squash getting the better of you. You're the boss here. Get your steel-toed boots because this fruit is tough. Don't be fooled, meeting a turban squash -- or kabocha or blue hubbard -- is a lot like being in a real-life country western showdown: one of you is going to get hurt.To Peel Or Not To Peel? If you want to eat it, you're going to have to peel it. The best way to tackle this fierce fruit is with a sharp knife, a steady hand and lots of patience. Is it worth it? We're not entirely sure -- we will leave that up to you. Just remember that there's nothing tough about this fruit. Spaghetti squash is looped in with winter squash, but it isn't close to as strong. To Peel Or Not To Peel? Nah. Just cut it in half, scoop out the seeds androast it in the oven. Once cooked, you can shred it into beautiful little strands of, well, spaghetti squash with nothing more than a fork. Remember, you can use its sweet flesh to make pie. And soup. But first, friends, first you have to figure out how to get in. And we're here to help. To Peel Or Not To Peel? Yep, you're going to have to peel it. 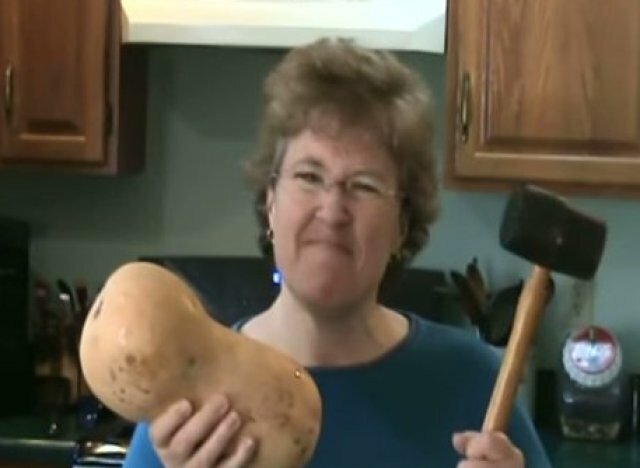 But just like with butternut, a potato peeler will work just fine. Place the pumpkin on its side, set it on top of a damp kitchen towel to help keep it in place. Lop off the top and bottom and then attack with a peeler. Just remember that there's an easy way around its tough exterior. To Peel Or Not To Peel? It is not, nor will it ever, be worth the effort of peeling. Not only does the thinness of the flesh make it 100 percent not worth it, but the size of this squash is perfect for stuffing. So, just cut it in half, scoop out the seeds and stuff away.